Always in the pursuit of excellence we are constantly researching and testing new materials in our wetsuits. We have now introduced a 5mm glide panel through the centre of the chest and waist, widening out through the hips, creating a better roll in your stroke, this panel, with fine dimple finish, diffuses the water and reduces the co-efficient drag factor. each Snugg suit is tailor made to your specific body shape. 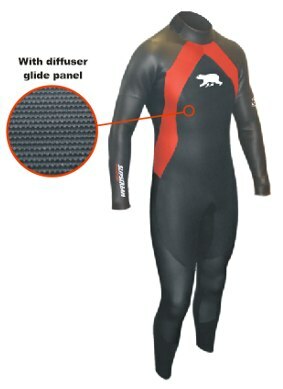 Our unique tailoring service coupled with Snuggs exclusive Buoyancy Control System ensures your wetsuit perfectly enhances your individual swimming ability. The importance of a correctly fitting triathlon wetsuit cannot be understated: a suit that is too tight may restrict breathing and certain movement. A suit too loose and you will be carrying an excess of water. Reducing your speed considerably. Another important factor is the buoyancy of your wetsuit; too much buoyancy in your suit can be as damaging to your swim time, as too little. Snuggs exclusively Buoyancy Control System enables us to design you a wetsuit that provides you with unrivalled hydrodynamics. By removing all the horizontal seams, we have radically redesigned the shoulder panel using Neo X neoprene, in conjunction with Mega Stretch 6006 to produce the most flexible lat panel (on the Slipstream this panel is increased to below the elbow giving maximum flexibility). With the combination of all these factors we have developed a wetsuit that will enable you to perform at the best of your ability, giving you the correct profile in the water for optimum speed. All our tailored suits are individually hand made, at our factory in Cornwall ,to your exact requirements, ensuring the highest quality. The ULTRALITE has the same buoyancy as the SLIPSTREAM. It has a smooth skin hydrophobic glide panel and neo-xstretch shoulder and lat panels finishing mid bicep.